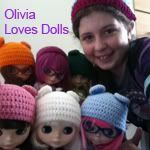 Also, I have been doing some blythe drawings, which, hopefully, I will post pictures of soon. They have just been rough sketches though. Maybe I will do a painting or good drawing on the weekend. And the couch I tried to make went OK ( I promise I'll share pictures soon ) but it works as a blythe bed anyway. I also made a double dog kennel for SImply Mango's blythe and a little doggy I made, from HERE.